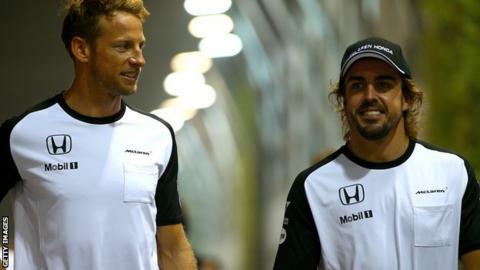 Button has said having Alonso as a team-mate is "a more consistent test"
Jenson Button says McLaren team-mate Fernando Alonso is a "bigger challenge" than Lewis Hamilton. Button, who was team-mate to Hamilton from 2010 until 2012, said driving against Alonso was a "more consistent" test. "Lewis, I'm guessing, is a different driver now, more experienced, but Fernando's always competitive." The 2009 world champion added: "If he's in front of you, you're holding on, and if he's behind you, he's pushing you along. "But that's great, I like that, I think that's important in a team." Button scored more points than Hamilton in their three seasons together at McLaren, although Hamilton won 10 races to Button's eight. Button has scored five more points than Alonso this season, but the Briton said that was coloured by the reliability problems suffered by McLaren in a difficult first season for their partnership with engine supplier Honda. "We've both had quite a lot of problems this year," Button said. "But sometimes you can luck into finishing a race when you're in a good position." Button said McLaren's difficulties had made no difference to Alonso's standing in the sport. "Before this year, he was regarded as the best driver in Formula 1," Button said. "It's amazing how quickly people forget. "He's very talented, a very rounded driver, a very complete driver. A lot of drivers have their strengths, but also big weaknesses, and I don't think he has a big weakness." Alonso, who was world champion in 2005 and 2006 with Renault, said he had no regrets about his move to McLaren from Ferrari. "It has been a tough year," the Spaniard said. 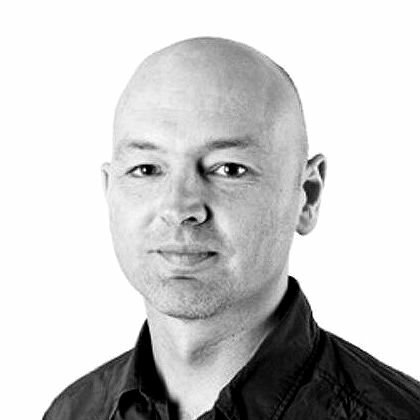 "Difficult and struggling with pace and reliability all year. "Personally, it was necessary, a step forward in my career, after two championships, after five fantastic years fighting for the world championship but finishing second, I needed some new project I could trust. "After one season, I enjoyed so much working with McLaren and Honda and with Japanese discipline and culture in the team. I am very, very happy and looking forward to next year being little easier than this year in terms of results. "I think next year we will be stronger than people think."